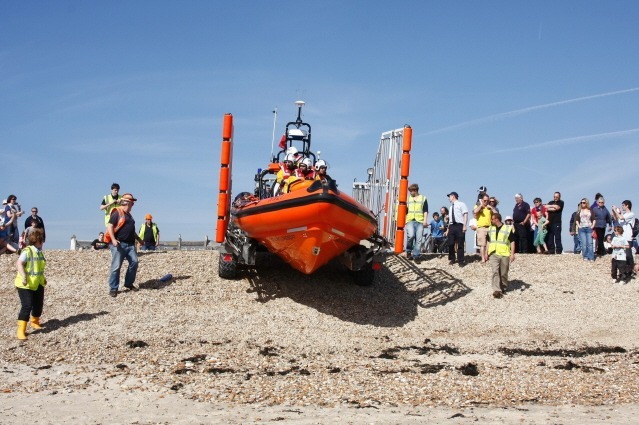 Hayling Island 999 Day once again proved to be a major attraction for locals and tourists alike! Although it was early April, it felt more like a summer’s day with blue skies and soaring temperatures. Stormy Stan came along with us and spent the day giving out badges and having his photo taken! The lifeboats, as always, proved extremely popular, as were the RNLI souvenir stall and the model lifeboats. Our B class Atlantic lifeboat Derrick Battle was on display all day with her launching vehicle, a county class tractor Betty. We left the arena at 3.30 to launch from the beach and were joined by the D class lifeboat Amanda James & Ben to give the days finale. The crowds of onlookers thoroughly enjoyed watching both boats show their power and agility in the water, followed by a demonstration of a casualty being rescued from the water. Or you can follow us on Facebook. We’re in full preparation mode for attending the 999 day at Beachlands on Sunday 10th April this year. We’ll be in the same position as last year, along with our souvenir stall and model lifeboats group. We exercised the County tractor and DODO rig around Sandy Point on Sunday morning to make sure there was enough access following the recent weather damage. As it was a beautiful sunny day, we came across many walkers on our route, all of whom were very interested in what we were up to! We also received two launch requests over the weekend (19th-20th March) bringing the total to 10 for the year so far. You can log on to our website at www.haylinglifeboats.org.uk to get full details of each launch request, and you can also follow us on Facebook. Dramatic scenes unfolded along the south east coast of Hayling Island this week, when a low pressure front overhead caused the sea levels to rise significantly, resulting in flooding on the roads and erosion of the beach. A lot of money has been spent on building up flood defences in this area over the years, and in a very short space of time ‘Mother Nature’ displayed her awesome power and wreaked havoc along the shore. Both sea and river defences may be overtopped or breached by a combination of low pressure weather systems and peak high tides. Storms with high wind speeds cause tall and powerful waves and low pressure fronts cause sea levels to rise above normal levels. High tide levels vary through the lunar and solar cycle and when superimposed upon other tidal variations exceptionally high tides result. The onset of flooding from the sea and tidal rivers is often sudden and the extreme forces driving it present a significant danger to life. The east coast storm surge of 1953 claimed 307 people’s lives in the UK and 1,835 in Holland. 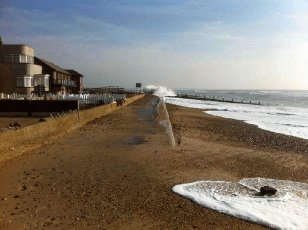 A similar storm surge tide in September 2007 came within a few centimetres of breaching a number of the UK’s coastal defences. These pictures show the damage along a stretch of coast from Eastoke Corner to Sandy Point. RNLI lifeboats at stations across Hampshire spent 336 hours at sea throughout 2010, according to the charity’s annual launch statistics released today (Tuesday).The figures – released to coincide with the charity’s biggest national fundraising day RNLI SOS Day on Friday 28 January – show that between four lifeboat stations at Lymington, Calshot, Portsmouth and Hayling Island, the charity’s lifeboats spent the equivalent of more than 14 whole days at sea.Collectively, crews from these four lifeboat stations rescued a total of 285 people, which is only made possible thanks to the ongoing generosity of RNLI supporters. The numbers highlight the level of commitment made by the volunteer crew men and women who regularly drop what they are doing and give up their own time to go to sea to aid others in distress. Indeed, they show that yet again RNLI’s lifeboats across the UK and Republic of Ireland had another busy year, launching a total of 8,713 times. Overall, the RNLI rescued a total of 8,313 people in 2010, more than the 8,186 rescued in 2009. Fundraisers at the charity hope the announcement will encourage the public to spare a thought for its dedicated volunteers, and get involved on the annual RNLI SOS Day. It takes place on Friday 28 January, when people all across the region will be taking part in activities designed to raise the much needed funds to help ensure the lifesaving service can continue. Andrew Ashton, Divisional Inspector for the RNLI East Division, said: ‘These figures show that once again RNLI lifeboats and their volunteer crews across Hampshire have had a busy year of saving lives at sea. When you consider that we are a charity, independent of the Government and the Coastguard, this is no mean feat. Volunteer lifeboat crew members at Lymington RNLI launched a total of 40 times in 2010, compared to a similar 41 in 2009. Calshot’s crew launched 113 times, 12 more launches than in 2009. Portsmouth RNLI also saw an increase in launches – 104 in 2010 compared to 95 in 2009. And Hayling Island RNLI lifeboats were launched 102 times, compared to 120 in 2009.